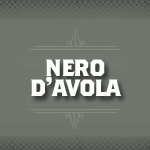 Nero d'Avola is an indigenous red wine grape variety from southern Sicily and is considered the most important red wine grape in the region. The grape is now also cultivated in the United States, Australia, Malta, turkey and South Africa. A sweet wine with blackberry, plum and pepper notes it is compared to New World Shirazes and also contributes to Marsala Rubino blends.